How does an entertainer achieve the status of hometown hero? By presenting the same generous, unpretentious spirit both offstage and on, and maintaining that consistency for more than 40 years. Oh, and it helps if the artist shares with a top-caliber band of ecstatic musicians a vast songbook of lyrically golden material attached to unforgettable melodies, and the dedicated production crew is helmed by an equally charismatic and kind persona who has been running sound since the very first tour in 1971. Sounds like an unattainable concoction, but this scenario has sold every seat in Madison Square Garden (MSG) on a monthly basis since January 2014, and gigs are already booked through 2015, with almost-certain rumors that the show will go on, and on. Billy Joel, in all his everybody’s-pal demeanor, is setting records and changing history as the fourth franchise in residence at MSG, alongside the Knicks, Rangers and Liberty professional sports teams. It’s the first franchise of its kind, and judging by ticket sales, the Billy Joel show is one team that doesn’t have to make the playoffs to fill an arena. As of February 18, 2015, Joel played 14 consecutive shows in the MSG run, necessitating the replacement of a “Billy Joel 13” banner hung from the rafters in January. That show marked the 60th time the Long Island native played at MSG over the course of his career, and upcoming concert dates predict that he will soon sail past Elton John’s record of 64 shows at MSG. Do the numbers really matter, though? The shows seem too fun to be about getting a notation in a history book. Joel is one of the great practitioners of giving it all on stage and enveloping the audience in his Piano Man vibe. In his anthemic “Say Goodbye to Hollywood,” the song Joel wrote when he opted to return to life in the crumbling city of New York in 1976, America’s hometown poet sings of “troubadours.” Those wandering musicians who carry their tunes to all ends of the earth definitely seem like a group to which Joel belongs. But it’s not only the artist who is the troubadour on this particular tour. He has a counterpart in the middle of the bustling and rippling sea of fans spreading across the arena floor. 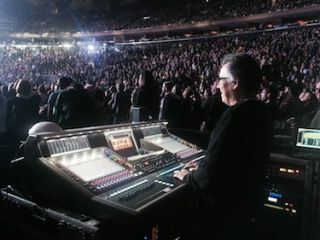 At front-of-house stands the sculptor of the shows’ atmosphere, Brian Ruggles, live sound engineer for Joel since the Cold Spring Harbor tour in 1971. Ruggles became acquainted with Joel through the late 1960s music scene in the towns near Huntington, NY, where both still have homes today. Both were in local bands, and when Joel invited Ruggles over to hear the music he was recording for his first full-length album, a life-long friendship and creative partnership was born. When an attempt is made to credit Ruggles with crafting the perfect, consistent vibe delivered across albums and concerts for decades, he shifts the attribution to legendary producer Phil Ramone, who built the Billy Joel playbook. “He was a brilliant man. I learned a lot from him,” Ruggles said. The set list for each show is a collaborative effort between Joel, Ruggles and another 40-year troubadour of the touring team, lighting designer Steve Cohen. There are songs that sit on the shelf for a time, songs that come back into play, and the three pillars of the arena-filling enterprise are curators of the event. The vibe, needless to say, is as close to a small pub sing along as you can get in a gigantic, domed sports venue. The decibel levels are just right for an elevated sense of excitement in an envelope of seamless audio. Ruggles’ FOH rack is efficient, a sharpened pencil for an artist who doesn’t need to throw a lot of paint around to make an impression. T.C. Group outboard gear hangs out next to a DiGiCo SD5 console linked to a ProTools rig that records every soundcheck and show for one more major long-term player on the force, Music Mix Mobile (M3). Being a resident artist franchise at MSG has its advantages, and one is that team Billy sound partner Clair Brothers has load-in down to a science. To work around MSG’s giant new scoreboard, a Clair PA is matched with delay rigs set at preset hang points that are ready and waiting for the each month’s show, making it easy for the Clair Brothers team to swiftly fly the system and connect it to Lab.gruppen amps in catwalk racks. Ruggles jokes that he’ll keep doing live sound as long as he can stand up, and judging by his energy and FOH golf-swing practices, that’s likely to be a long time. Ruggles has also mixed live albums for Joel in the past, and he’s getting ready to work with Joel on selection of the best live recordings from this recent tour as well. It’s impossible to resist singing along with Billy Joel’s music. Even the MSG workers setting up chairs before the February 18 show were singing with soundcheck. On stage later that night, Joel smiled each time the audience helped out with the vocals. Across the field of dancing fans at FOH, Ruggles also grinned, proving that he really does feel like he won the lottery, as he said before curtain that night. There definitely is a unified camaraderie among the chorus of 20,000 singing fans at MSG, making it evident that we are all troubadours of the Billy Joel songbook, and Brian Ruggles is the man who carries our tune.